Bio Spot for Dogs Ingredients - How Does It Work? How does Bio Spot for dogs work, and why is this medication so effective? This medication includes two drugs, and each has a specific purpose. Permethrin is one active ingredient, and this is an insecticide which kills ticks and other insects. Dog flea control is achieved with the second ingredient in this medication, called S-Methoprene. This ingredient is an insect growth regulator, and this means it prevents flea eggs and larvae from surviving and keeps your pet and environment flea free. The combination of ingredients in Bio Spot for dogs makes it highly effective at eliminating any flea infestation that may have already started, and preventing any future infestation from occurring. The comparison of Bio Spot vs. Frontline will show that there is a big price difference between the two, and they each have different ingredients. Both contain an insecticide, and both are used topically and absorbed through the skin. 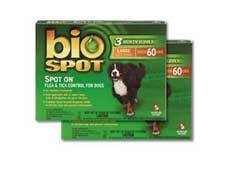 Bio Spot for dogs has two separate ingredients though, and some pet owners say that this product seems to work better. The S-Methoprene component of this flea medication can also be found in Frontline Plus for dogs, so that fleas can not become adults and breed to create an infestation. Many vets recommend Bio Spot for dogs, because of the way that this product works as well as the lower cost. The two ingredients in the product will kill off any fleas that are present, as well as ticks and mosquitoes, and also prevent any eggs or larvae to reach adulthood. Stopping an infestation is important, because fleas and ticks pose health risks to humans as well as your pets. The best dog fleas treatment is one that is effective for all stages of flea growth, from egg to adulthood. This requires two different substances, a pesticide to kill off live pests and a growth regulator for insects that will disrupt the life cycle of the flea.